nothing you really like is ever out of style." Crazy week as usual but today is my day off and I wanted to do a post about some beautiful things! Thankyou to everyone who left comments about the Movie Costumes - I'm so glad that you enjoyed the photos! I had so much fun taking them and the exhibit was so lovely I was very excited to share it! Today I have taken photos of some of the treasures in my house that revolve around my favorite style - French! I find that french furniture, ornaments, and accessories are the most beautiful and feminine that a girl can find. They have an elegance and softness that appeals to me so much and when I see them I automatically feel at home. 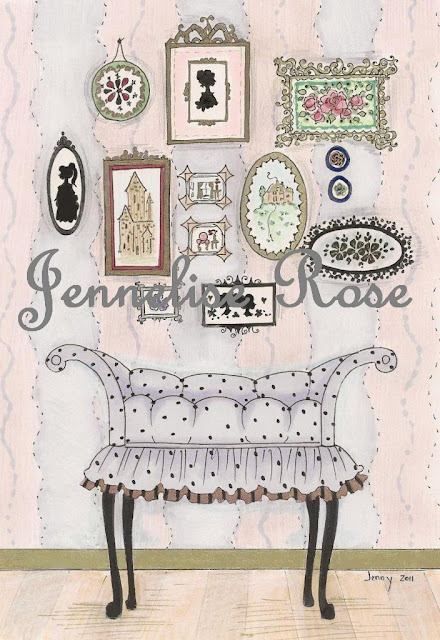 I have also done a new little drawing that I thought fit with the whimsical side of French interiors. I hope you enjoy these few French treasures and find time to relax and enjoy the beautiful autumn afternoons. Gorgeous eye candy photo's and your pastel drawing is fantastic!! 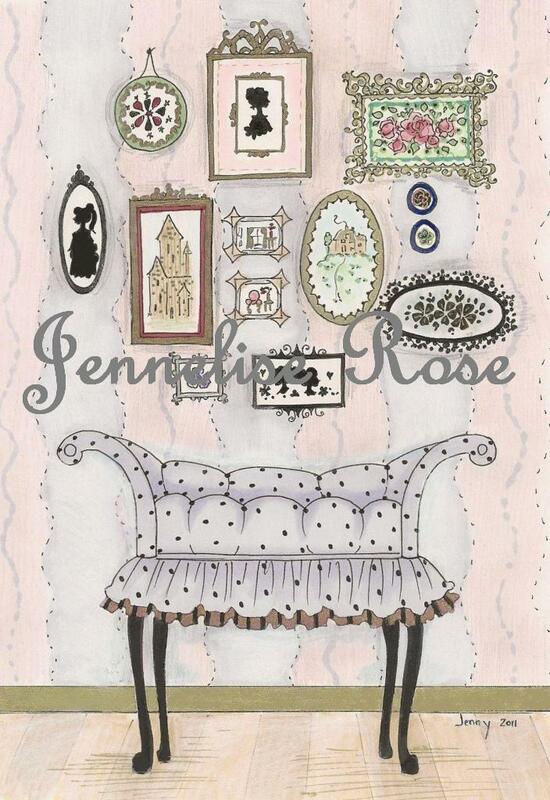 Oooo love all these photos, such beautiful fancy shabby chic decor!! Love and appreciate all the beautiful and exquisite details, the curves Louis XV of the stand with marble and roses and your new drawing ! Jennelise , vous êtes une française très raffinée!!! What a gorgeous post! I love all the romance, I'd love to curl up and never leave. Stunning! You are so talented! I love your drawings at the end! ! ! Hélène Flont✿◕ ‿ ◕✿ A rose affair between Jane Austen and Marie-Antoinette ! All photographs, artwork, and poems - unless otherwise credited - are the property of Jennelise. Ethereal theme. Theme images by kim258. Powered by Blogger.